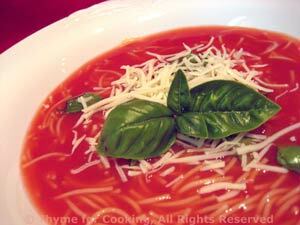 Tomato Vermicelli Soup, Thyme for Cooking soups. This is an easy summer soup using pantry items. If made a bit ahead it can be welled chilled but if you can't, just chill the tomato juice ahead of time; even with warm vermicelli, the soup will be cool. Garnish with some fresh basil. Heat the stock in a saucepan until boiling. Remove from heat and let cool - it will finish cooking and not get too done. When no longer hot, add the tomato juice, stir well and chill until ready to serve. Divide the cheese and sprinkle over the top. Note: If a lot of stock evaporates, you can add a bit of ice to help cool the soup and 'reconstitute' the beef stock.